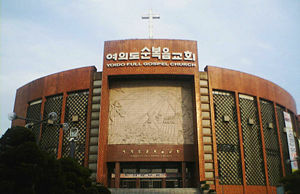 Yoido Full Gospel Church, Seoul, with the world's largest Christian congregation. East Asia was one of the last areas to receive Christianity, beginning in about the seventeenth century. Today, Korea has the largest Christian population by percentage of all the countries in Asia. Beginning as a lay-movement among Silhak scholars who saw Christianity as an ideological catalyst for their egalitarian values, Christianity managed to assimilate, and be assimilated by, Korean culture. The church went through a period of persecution in the early nineteenth century and many missionaries and faithful were executed. During the Japanese occupation of Korea (1905-1945) many Korean Christians refused to participate in Japanese emperor-worship and suffered martyrdom, while those who complied suffered excommunication. As a result, the church became solidly identified with Korean nationalism and went on to dominate Korean society during the post-war years. Korean Christianity today maintains a strong and vibrant presence, and faces new challenges as Korean society matures. Korean history has long included elements of Shamanism, Confucianism and Buddhism. The early Shamanist Koreans had an essentially monotheistic concept of a Creator-God, whom they called Hwan-in (환인) or Haneu-nim (하느님) (later also Hana-nim (하나님)). According to an ancient myth, Hwan-in had a son named Hwan-ung (환웅), who, in turn, had fathered a human son named Tangun (단군) in 2333 B.C.E. Tangun founded the Korean nation and taught his people the elements of civilization during his thousand-year reign. Buddhism was introduced to Korea in 372 C.E., and Korean Buddhism developed, incorporating certain elements from Shamanism. During the Silla (57 B.C.E. - 935 C.E.) and Goryeo (935-1392) periods, the social and political structure was modelled after Confucianism, and the religious thinking was oriented toward Buddhism. As the Joseon period began, from 1392, the Confucian / Buddhist split between state and church was eliminated, and a Neo-Confucian ideology had the controlling hand in both. As time went by, many people, especially those outside the yangban, or aristocratic class, began to express discontentment with the ideological state of things. This is one condition that opened the door to Christianity. Father Gregorious de Cespedes, a Jesuit priest arrived in Korea (Joseon) in 1593 and began working among Japanese expatriates, since there was a prohibition by the Korean government against proselytizing Koreans. A decade later, the Korean diplomat Yi Kwangjong (이광정) returned from Beijing carrying a world atlas and several theological books written by Matteo Ricci, a Jesuit missionary to China. Ricci's books provoked immediate academic controversy; early in the seventeenth century, Yi Sugwang (이수광; a court scholar) and Yu Mongin (유몽인; a cabinet minister) wrote highly critical commentaries on Ricci's works. Over the ensuing two centuries, academic criticism of Christian beliefs continued unabated. The Silhak school arose in the seventeenth century in response to an uneven balance of power in society. Many Silhak (실학; "practical learning") scholars were attracted by the egalitarian values of Christianity. Advocating a social structure based on merit rather than birth, Silhak scholars saw Christianity as providing an ideological basis for their beliefs. Many Silhak scholars accepted Catholicism as it became more publicly known after 1784, and supported its expansion in the 1790s. An 1801 report stated that 55 percent of all Catholics had family ties to the Silhak school. 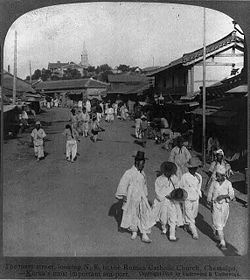 During the seventeenth and early eighteenth centuries, Christianity in Korea was in indigenous lay movement. Korean Catholics developed their faith through studying texts brought in from China, developing a community of faith similar to the very early church in the first centuries after Christ, rather than the more hierarchically structured church that had developed in Europe by that time. In 1784, Yi Sung-hun (이승훈), the son of a diplomat, baptized during a trip to Beijing, returned to Korea and established the country's first Catholic prayer-house in Pyeongyang (평양 - now the capital of North Korea) In 1786, Yi proceeded to establish a hierarchy of lay-priests. Although the Vatican later ruled (in 1789) that the appointment of lay-priests violated Canon Law, the fact remains that credit for the early spread of the Catholic faith in Korea goes to the indigenous lay-workers, not the official representatives of Rome. While Korea's aristocracy and government were still conducting their written work in Chinese, the early Catholics used the easily-learned hangul (한글) script enabling the faith to spread outside the elite. As early as the 1780s, portions of the Gospels appeared in hangul; doctrinal books such as the Chugyo Yogi (주교여기) in the 1790s, and a Catholic hymnal around 1800. During the first half of the nineteenth century, when Korea closed to foreigners thousands of Catholics suffered martyrdom. The Confucianist establishment, including the Joseon Dynasty rulers, did not embrace Christianity. One big stumbling block was the official stance of the papacy, as expressed in a papal degree in 1742, that declared Christians could not participate in ancestor worship. This was in direct conflict with Confucian practice, as ceremonies to honor the ancestors formed an integral part of Korean Confucian society, and was seen as expressing the esteemed ethic of filial piety. For this and other reasons, Catholicism was perceived as a threat to maintaining the integrity of Korean society. The degree of objection varied, depending who was on the throne; some of the Yi Dynasty rulers persecuted the Catholics severely, including Queen Dowager Kim, when she served as regent for King Sunjo (1800-1834). A number of priests were killed or banished during the Catholic Persecution of 1801, which she ordered. Catholics who sought seek help from overseas to procure religious freedom in Korea were punished as traitors. As the political parties influencing the court juggled for control, opposition to Catholicism waxed and waned. Three foreign priests, along with a number of local converts were executed in the Catholic Persecution of 1839. A few years later, Korea's first native-born Catholic priest, Andrew Kim Taegon, was beheaded in 1846, at the age of 25, when he continued to proselytize after the crackdown. The largest massacre of Catholics was carried out in 1866, under Daewongun, while he served as regent for King Gojong. In the Catholic Persecution of 1866, nine French missionaries and Korean converts, numbering in the thousands were killed. The killings in 1866 attracted the attention of the French, who began to visit Korea seeking retaliation for the murder of their priests. The first Protestant missionary martyr in Korea was Robert Jermain Thomas (1839-1866). A Welsh missionary with the London Missionary Society, in 1863 he went to Beijing and there met two Korean traders who told him about the Catholic converts who had no Bibles. Thomas became an agent of the Scottish Bible Society and traveled to Korea to sell Bibles. Later he found a job as an interpreter on the armed American schooner the General Sherman. As the boat traveled around Korea Thomas handed out Bibles. When the boat became involved in a firefight with the Korean army near Pyongyang, Thomas jumped overboard with his Bibles and handed them out to the angry crowd on the river bank while shouting out, "Jesus, Jesus." He handed his last Bible to his executioner. The Korean authorities ordered people to destroy their Bibles. Some used them as wallpaper and from those who came to believe in Jesus a Presbyterian congregation was formed. Many of the early Korean Christians embraced the Christian gospel through reading the Bible given to them by Thomas. Since many Catholic missionaries and converts had been killed in Joseon Korea during the first half of the nineteenth century, the United States, in their 1882 Treaty of Amity and Trade negotiated with Korea included a clause of protection for their missionaries. The first Protestant missionary to Korea from the United States, Horace Allen, a Presbyterian, arrived two years later, in 1884, followed in 1885 by Horace Underwood, Presbyterian, a group of Methodist missionaries, which included Henry Appenzeller and Mary Scranton, and others. Joseon of the 1880s still outlawed proselytizing for religious conversion, so the missionaries focused their work on medical and educational work. Horace Allen, the first missionary to arrive, focused on medical work, and introduced many techniques of western medicine that had previously been unknown in Korea. King Gojong was impressed and granted Allen permission to open the country's first Western medicine facility. First called Gwanghyewon (廣惠院, House of Extended Grace), then renamed Jejungwon (제중원 濟衆院, House of Universal Helpfulness), the clinic later grew into the Severance Hospital, affiliated with Yonsei University. Jejungwon provided modern medical care, and also provided classes educating local physicians in modern medical techniques. The missionaries who arrived in 1885 focused mainly on education and social service. Methodist missionary Henry Appenzeller, discovering that many Korean people could not read, opened his first school the same year he arrived, which was later named Pai Chai Hak Dang (배재학당), and endorsed by King Gojong. Horace Underwood, about a year after he arrived, established an orphanage, which later grow into the Gyeongsin High School. Traditionally in Korea, girls did not attend school. 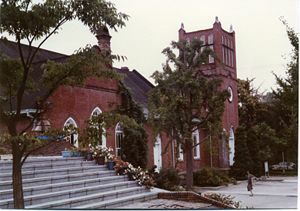 Missionary Mary Scranton, with the support of Queen Min, established the Ewha Hak Dang (이화학당, Pear Blossom Academy), a missionary school for girls, in 1886. 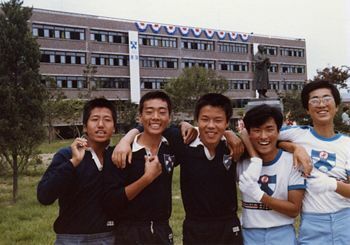 Many of Korea's top universities today have their roots in the missionary schools of the late nineteenth century, including Ewha Women's University and Yonsei University (from Gyeongsin High School, which was later Yonhi University). The missionaries continued to create schools in each area of the country where they worked. The schools taught students to read in Hangul, the Korean alphabet, which was much easier to read than the Chinese script studied by the aristocracy. There were not many hangul texts available, and the students often studied hangul translations of the Bible. They used sections of the Bible translated by Reverend John Ross, a Scottish Presbyterian missionary in Manchuria, by Lee Sujung, a Korean Christian living in Japan, and later, a full translation of the New Testament, translated in sections by a team of missionaries working in Korea in the late nineteenth century, completed in 1900. These, and similar schools established soon afterwards, facilitated the formal education and the rapid expansion of Protestantism among the common people, and in time enabled the Protestant faith to overtake Catholicism as the leading Christian voice in Korea. Many Christians identified with Korean's independence movement during the Japanese occupation (1905-1945). The Korean people suffered greatly during that period, with seven million people exiled or deported from their homeland by the Japanese, and a systematic campaign of cultural assimilation. In 1938, Japan even outlawed the Korean language. On March 1, 1919, an assembly of 33 religious and professional leaders passed a Declaration of Independence, marking the beginning of the (March First Movement). Although organized by leaders of the Cheondogyo (천도교) religion, 15 of the 33 signatories professed Christianity, and many of them suffered imprisonment for their role in the movement. 1919 also saw the establishment of the predominantly Catholic Ulmindan (울민단) (Righteous People's Army), a pro-independence movement, and the establishment of a China-based government-in-exile by Syngman Rhee (이승만), a Methodist. But the refusal by many Christians to participate in the worship of the Japanese Emperor, compulsory in the 1930s, proved the primary catalyst that linked Christianity with the patriotic cause in the eyes of many Koreans. Although their refusal to worship the emperor arose from theological rather than political convictions, the consequent imprisonment of many Christians blended their faith with the cause of Korean nationalism and resistance to the Japanese occupation in the eyes of many Koreans. Christianity has played an important role in Korea's transformation from a feudal to a modern society. The early impact of the introduction of Christianity on education has already been mentioned. The promotion of the easily learned phonetic Hangul writing system, through the network of schools established by Christian missions and the dissemination of Christian literature, resulted in a sharp rise in the literacy rate. Hangul, although invented as far back as 1446 by scholars in the court of King Sejong (세종대왕) was little used for several centuries because of the perceived cultural superiority of Chinese. 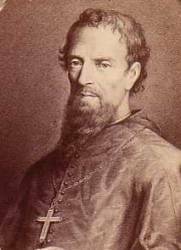 The Catholic Church recognized the value of Hangul, and Bishop Berneux (martyred in 1866) instructed that all Catholic children be taught to read it. Protestant churches, too, made literacy in Hangul a prerequisite for admission to Holy Communion. Although women had traditionally been excluded from the educational system, under the auspices of the mission schools, female literacy also rose sharply. While the constitution of South Korea guarantees freedom of religion as well as separation of church and state, the government has been favorable to Christianity, regarding the religion as an ideological bulwark against Communism. According to Korean census figures, about 29 percent of the Korean population professed Christianity in 2005, while the Religious Yearbook of a Protestant research group puts the figure at over 40 percent. Many South Korean Christians view their religious faith as a factor in the country's dramatic economic growth over the past three decades, believing that success and prosperity are indications of God's blessing. Surveys have shown South Korean Christians are active in their religion, quite often exceeding their American counterparts in such areas as frequency of attendance at group worship services. Assessing the effects of Christianity on economic growth and prosperity in isolation from other influences such as indigenous cultural values and work ethic, a strong alliance with the USA and the infusion of foreign capital presents a challenge. Neighboring Japan has achieved comparable economic strength in parallel with Korea, but with a miniscule proportion of Christians (less than one percent of its population). Even so, at least one study suggests a correlation which may buttress the contention that Christianity has played a major role in the economic success of the nation. Christian values have had a revolutionary effect in the area of social relationships. Korean society has been shaped by Confucianism's hierarchically teaching, which works well when the people at the top of the hierarchy take responsibility and care for those below in the working classes. This system can quickly turn despotic when those at the top no longer have the means or desire to care for the wellbeing of society as a whole. 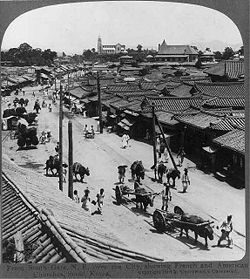 Much of the Korean population comprised the lower classes in the later part of the Joseon Dynasty. Women lacked education and social rights; children were often expected to be like slaves to their parents; and individuals' rights had little standing. The Christian teaching that all men are created in the "Image of God" (Genesis 1.26-27), and thus that every individual has implicit worth, radically challenged that structure. The right to own private property closely aligned to that concept. The diffusion of Christian values contributed to the social emancipation of women and children. From its inception in 1784, the Catholic Church permitted the remarriage of widows (not traditionally allowed in East Asian societies); prohibited concubinage and polygamy; and forbade cruelty to or desertion of wives. Catholic parents were taught to regard each of their children as gifts from God; not just the first-born son, and to educate each one. The Church prohibited the traditional arranged child marriages, and the neglect of daughters (who, in Asian society were often regarded as less "desirable" than sons). On the other hand, the Christian prohibition of ancestor worship put a strain on family and social relationships in a Confucianist society where veneration of ancestors has long been an expression of the esteemed virtue of filial piety. Traditional Koreans did not confuse the veneration of ancestors with the worship of God; nevertheless Christians strictly prohibited the practice. This created feelings of distrust and resentment against Christian practices and beliefs that even divided families. Furthermore, many Christian denominations had a Fundamentalist outlook that disparaged believers in Buddhism and Confucianism, thus breaking up social and familial cohesion in a society that had been relatively tolerant of religious diversity. Minjung theology arose in Korea in the 1970s as a result of the suffering that the people went through in the process of recreating Korea into a democracy. The word minjung is made from the Chinese character 'min' which means 'people' and the character 'jung' means 'the mass', so when put them together it translates to 'the common people'. Minjung theology interprets the Bible and history in terms of what happens to the 'minjung' (common people). Most accounts of history have been written and interpreted by the upper classes, the elite of society, who tend to judge and interpret the trends in history by what happens to the kings, to the political leaders, to the economically powerful. But minjung adherents will judge history by the status of the minjung, by the situation of the masses that make up the society that is the underpinnings for the elite. If the status and situation of the minjung was tolerable and sustainable, that part of history should be judged favorably. If the minjung were exploited, then that period should be considered a dark period. Looking at the Bible from a minjung point of view, Jesus and Christianity have appeared in order to improve the state of the minjung, to make life on the earth more comfortable and pleasant for the minjung. Emphasizing nationalism as well as human rights, Minjung Theology appeals increasingly to both right and left, politically, in Korean society. The rise of several Christian missions, including the Catholic Farmers Movement and the (Protestant) Urban Industrial Mission, which campaigned for better wages and working conditions for agricultural and industrial workers presents a manifestation of Minjung Theology in the final years of the Park Chung-hee (박정희) regime (1961-1979). Seeing such movements as a threat to social stability, the government arrested and imprisoned many of their leaders. This struggle coincided with a period of popular unrest which culminated in the assassination of President Park on October 26, 1979. Two of the country's best known political leaders, Kim Young-sam (김영삼) and Kim Dae-jung (김대중) subscribed to Minjung Theology. Both men spent decades opposing military-led governments in South Korea, and frequently suffered imprisonment. Kim Young-sam, a Presbyterian, and Kim Dae-jung, a Roman Catholic, each later served terms as President of the Republic after democracy was restored in 1988. Over the past century, Christianity has grown dramatically in South Korea, now 29 percent of the population. Prior to the Korean War, two thirds of the country's Christians lived in the North, but most subsequently fled to the South. Christians who remained in North Korea have been severely repressed, and the number remaining there is unknown. According to the 2005 Census, approximately 18 percent of the population of South Korea considered themselves Protestant and nearly 11 percent Roman Catholic. Two major groups cover most of the remainder: 23 percent Buddhist and 47 percent "no religion." 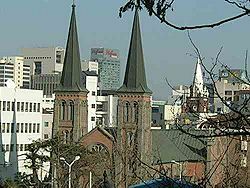 Seoul, the capital, has 11 of the world's 12 largest Christian congregations. South Korea sends out more foreign missionaries than any other country except the United States, and South Korean missionaries are especially well-represented in nations hostile to Americans and Europeans. In 2000, 10,646 Korean Protestant missionaries served in 156 countries, along with a large number of Catholic missionaries. Korean Christian David Yonggi Cho (조용기), has attained worldwide prominence as founder of the colossal Yoido Full Gospel Church, the largest Christian congregation in the world. 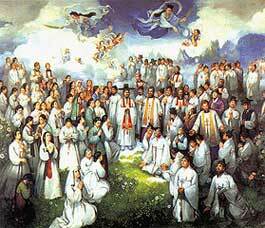 Korea has more canonized saints than any other country except Italy. Pope John Paul II traveled to Seoul in 1984 to conducted the first canonization ceremony to be held outside of Rome, canonizing 105 saints into the Roman Catholic Church. South Korea's transition from 40 years of authoritarianism (interrupted only once, in the short-lived Second Republic (1960-1961) to a more liberal, democratic regime in 1988, left Korea's churches facing a new challenge. Their strong stand for human rights and democracy had been a significant part of their appeal to the Korean population, and had helped facilitate the exponential growth of many churches in the 1970s and early 1980s. The coming of democracy, which made Christians a part of the establishment as never before, left many Christians feeling that the Church had become a victim of its own success, as freedom and prosperity led to widespread complacency and a loss of the churches' "cutting edge." Church growth tapered off, for the first time in decades. Furthermore, many now argue that the fundamentalist zeal that strengthened Christianity in times of hardship has become a liability as Korean society matures and looks to become more tolerant and inclusive. The attitude on the part of some pastors to condemn both non-Christian fellow Koreans as well as Christian believers in rival denominations—an attitude that formerly was tolerated within the free-wheeling spirit of competition—is now regarded by many as unseemly, leading many believers reflect on whether true Christian compassion is lacking in these churches. Christian intolerance towards the Unification Church for example, used to be widely shared by Korean society when Unification believers were few in number and their efforts unknown. By the mid-1990s however, the good works and international reach of this new, indigenous, Korean church has led increasing numbers of Koreans to long for a Christianity that is broader in its embrace of all Korean people. For those Christians who continue with their determination to evangelize the nation, the future may bring the prospect of new missions to North Korea. With a possible economic and political collapse of the North Korean regime looming, South Korean churches are developing contingency plans to mobilize both spiritual and humanitarian resources to aid the North. It will be interesting to see whether in the North, where the Unification Church has a solid beachhead, the churches can shed their animus and work cooperatively. Encyclopedia Americana (1986). Vol. 23, Danbury, CT: Grolier. ISBN 0717201171 (set). Fisher, J. Earnest. 1977. Pioneers of Modern Korea. Seoul: Christian Literature Society of Korea Focus on Korea (1986). Vol. 2, "Korean History," Seoul: Seoul International Pub. House. Ilyon 1972. Samguk Yusa: Legends and History of the Three Kingdoms of Ancient Korea trans. Tae-Hung Ha and Grafton K. Mintz. Seoul: Yonsei University Press. Johnson, Marguerite. An Ancient Nation on the Eve of a Modern Spectacle. TIME (magazine) 1988-09-05. Keesing's (1979). Keesing's Contemporary Archives 25: 30216. ISSN 0022-9679. Lee, Michael, "Korean Churches Pursue Social and Political Justice." Accent 3 (3) (May 1981). Merit Students Encyclopedia (1980). Vol. 10, New York: Macmillan Educational. Suh, Kuk-sung, et al. The Identity of the Korean People: A History of Legitimacy on the Korean Peninsula,trans. Chung Chung. Seoul: National Unification Board, 1983. Whittaker, Colin. Korea Miracle. Eastbourne, Sussex, UK: Kingsway, 1988. ISBN 0860655229. History of "Christianity in Korea"
This page was last modified on 18 February 2017, at 21:10.